The retrieval problems arising in atmospheric remote sensing belong to the class of the - called discrete ill-posed problems. These problems are unstable under data perturbations, and can be solved by numerical regularization methods, in which the solution is stabilized by taking additional information into account. 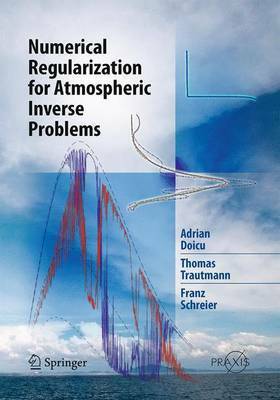 The goal of this research monograph is to present and analyze numerical algorithms for atmospheric retrieval. The book is aimed at physicists and engineers with some ba- ground in numerical linear algebra and matrix computations. Although there are many practical details in this book, for a robust and ef?cient implementation of all numerical algorithms, the reader should consult the literature cited. The data model adopted in our analysis is semi-stochastic. From a practical point of view, there are no signi?cant differences between a semi-stochastic and a determin- tic framework; the differences are relevant from a theoretical point of view, e.g., in the convergence and convergence rates analysis. After an introductory chapter providing the state of the art in passive atmospheric remote sensing, Chapter 2 introduces the concept of ill-posedness for linear discrete eq- tions. To illustrate the dif?culties associated with the solution of discrete ill-posed pr- lems, we consider the temperature retrieval by nadir sounding and analyze the solvability of the discrete equation by using the singular value decomposition of the forward model matrix.